There’s a plethora of wonderful children’s books on gardening, but there is always room for more! What’s This? 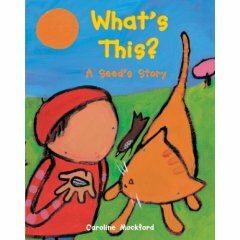 A Seed’s Story by Caroline Mockford is a charming story about a child’s discovery of a seed and the cycle of plant life. I was lucky enough to have my six-year-old daughter read this book to me for her homework. The girl tends to her seed, and then one day, it starts to grow. At this point during our reading, I asked my daughter what kind of plant she thought it would be. She guessed a flower, and I guessed a pea. As the plant grew taller and taller, I changed my prediction to a bean, and noticing the pole used to support the plant, my daughter thought it must be clematis. Every day when she woke up, the little girl ran straight out to the garden to look at the plant that was growing from the seed. And one morning, when she ran outside, there, turning its head to the sun, was a magnificent sunflower. Organic gardening with children is challenging at times, but it is also very rewarding. The fact that my daughter would guess that a plant in a book illustration is clematis shows that her plant knowledge is far superior to my own at six years of age. As spring time approaches, you can look forward to many posts on Eco Child’s Play about gardening with children. I love this and can’t wait to get it for my daughter! What a great introduction to the cycle of life. How Much Added Sugar Does Your Family Consume?